This comfort chair/ bed/ mat/ mattress gives you the flexibility you desire and comfort you expect anywhere. You love to use it for taking naps, reading a book or TV time, it is flexible enough to suit the activities of your children with its convertible positions. It can unfold into a bed, it can completely fold up into a comfortable chair and can serve as a reclining lounge chair. The space-saving conversions can be easily made in no time. This versatile flip chair is made of a linen material for added comfort. Is not only multi-functional but also trendy. This rich shade chair will add ambiance to any room. You could place this foldable chair foam Bed in living room, guest room, patio, family room, studio, RV trailer, mobile home, boat, mini van, truck. About the company: Inspired Home Co. provides modern casual, on-trend occasional furniture, ottomans, benches, fabric headboards and beds, side tables, dining chairs, bar-stools, accent chairs, accent tables and sofas. Inspired Home is known for providing fashion forward designs, quality home furnishings at affordable prices. 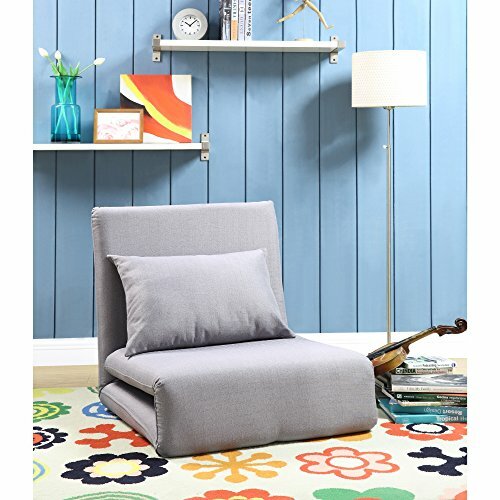 MODERN DESIGN - The modern stylish 5-position adjustable floor chair of bright color makes this furniture not only a flip chair or bed couch, but also decoration for any room. CONVERTIBLE - Chair easily converts into a bed. The steel frame is durable and sturdy, and it will serve you for a long time. RECLINER CHAIR - Easily adjust its back to positions from flat to upright, allowing you to recline at the most comfortable angle for reading, meditating, watching TV or playing games. PILLOW - 1 pillow included for exceptional comfort. DIMENSIONS: Bed Size - 78,7"L x 27.9"W x 3.9" H. Chair Size - 27.1"L x 27.9"W x 26.7"H.
If you have any questions about this product by Loungie, contact us by completing and submitting the form below. If you are looking for a specif part number, please include it with your message.